Today is the day. Received the new iPhone XS Max around noon. I love online pre-order. No need to wake up early and spend hours in queue, with guarantee to get the same item on the same day. Continuing my usual 2-yearly upgrade cycle, this year I upgraded from iPhone 7 to iPhone XS Max. 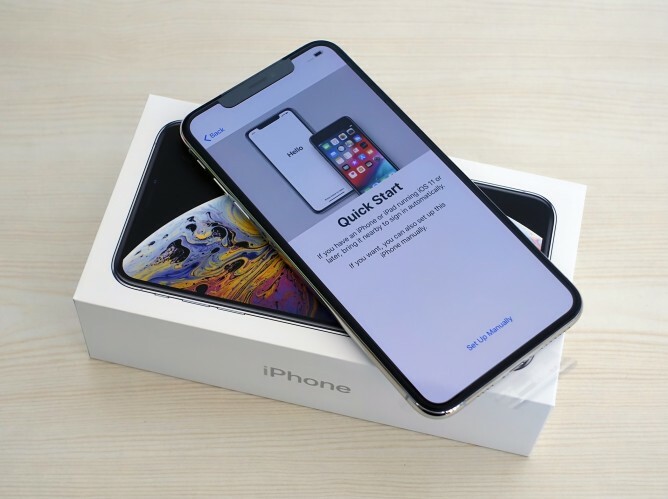 I was seriously tempted with iPhone XR, but finally decided on XS Max because of the significantly better display. Let’s start with the mandatory opening: specs. iPhone XS Max is the biggest iPhone Apple has ever made. It has 6.5″ screen with Super Retina HD display using OLED technology, and don’t forget about the infamous notch. The screen gives us 2688‑by-1242‑pixel resolution at 458 ppi with 1,000,000:1 contrast ratio and HDR display. Physically, it measures around 157.5 x 77.4 mm, not that gigantic compared to iPhone 8 Plus. However, thanks to the new (almost) edge-to-edge display, it measures significantly longer diagonal. The phone’s weight is 208 gr, clearly more than my old iPhone 7, but I don’t feel any discomfort in using it so far. iPhone XS Max is splash, water and dust resistant rated IP68 (maximum depth of 2 meters up to 30 minutes). From the inside, iPhone XS Max is powered by Apple A12 Bionic processor and 4 GB RAM. For connectivity, it has Gigabit-class LTE with 4×4 MIMO and LAA4, 802.11ac Wi‑Fi with 2×2 MIMO, Bluetooth 5.0 wireless technology and NFC with reader mode, Assisted GPS, GLONASS, Galileo and QZSS. The back camera is Dual 12MP wide-angle and telephoto cameras with Wide-angle: ƒ/1.8 aperture, Telephoto: ƒ/2.4 aperture, 2x optical zoom; digital zoom up to 10x, Portrait mode with advanced bokeh and Depth Control, Portrait Lighting with five effects (Natural, Studio, Contour, Stage, Stage Mono), Dual optical image stabilization, Six‑element lens, Quad-LED True Tone flash with Slow Sync, Panorama (up to 63MP), Sapphire crystal lens cover, Backside illumination sensor, Hybrid IR filter, Autofocus with Focus Pixels, Tap to focus with Focus Pixels, Smart HDR for photos, Wide color capture for photos and Live Photos, Local tone mapping, Advanced red-eye correction, Exposure control and Auto image stabilization. For video, it can capture 4K video recording at 24 fps, 30 fps, or 60 fps, 1080p HD video recording at 30 fps or 60 fps, 720p HD video recording at 30 fps, Extended dynamic range for video up to 30 fps. The front TrueDepth camera is 7MP camera with ƒ/2.2 aperture, Portrait mode with advanced bokeh and Depth Control, Portrait Lighting with five effects (Natural, Studio, Contour, Stage, Stage Mono). Okay, I admit, that was a lazy copy-paste. Now, getting to the actual content: my impression. First, I was rather surprised that the actual phone is not as big as what I had in my mind. As soon as I was holding it, I don’t get the feeling of using oversized phone. It is large, but not excessively large. Build quality is excellent, as what I would expect from Apple, or any other phone in this price range, actually. The sound volume is loud. With the same setting as my iPhone 7, this new XS Max deliver significantly louder sound, forcing me to adjust all sound settings. One-handed operation is not easy, but still doable. Since I’m upgrading from iPhone 7, I had to experience FaceID for the first time and the new gesture to replace home button. I like the fact that FaceID is quite fast, but I still can’t shake the feeling that I miss home button and TouchID. Maybe this will change over time. This phone is fast. Everything feels very responsive and snappy. Since the form factor is kinda new, some of my apps look a bit funny in the rather-long screen. I don’t like the fact that I can no longer see the numeric percentage of remaining battery power in my home screen. Yes I can still see it once I pull down the Control Centre, but that would mean one extra step to see what I usually can get without extra effort. Pulling down Control Centre instead of flicking up is a new habit I need to get used to, and I presume this could become annoyance when I need to use this phone with only one hand. I tried paying using Apple Pay and driving using Google Maps in CarPlay. Both features work fine. I’m still a bit concerned that the phone detecting my face is actually one less step for me to confirm that I’m authorising a transaction. I’ll more more experiments on this in the near future. Google Maps in CarPlay is so much better than Apple Maps. Still waiting for Waze and Sygic to release their CarPlay compatibility updates though. Very strong first-day impressions. I get a feeling that I will either love or hate this phone. There are a lot of positive points, but I can see some potential issues as well thanks to its size, new gestures and the missing TouchID.